Success isn’t always easy to achieve. Of course, to different people success may mean many different things. For some, success means owning a business for themselves, to others it means having a great family, and to others it means having a certain level of income or respect or notoriety. None of these things are bad in and of themselves, provided that they are all means to bring a person to true contentment with where they are. Contentment could be the truest measure of success there is. But whatever you define as “success,” in order to truly feel content about where you are and how you are using your gifts and talents you’ve been blessed with, there are several things that you must have going for you to help you reach your goals. What are you willing to do in order to get where you’re trying to go? You can’t get there just any kind of way; you must have boundaries. Now all of us have broken the rules at some time. But thank God we had rules to begin with. Today, many don’t seem to know or care where ‘right’ is. It’s interesting that in our society, those that lack moral standing find what most people would consider to be “success” but to them it’s never enough. Actors who continue to turn to drugs and corporate executives that rob their employees to put an additional million in their pocket are just a couple of examples. These people are not content precisely because they have no moral boundaries. For them it’s always about getting more, more and more and never being happy with the success they have already achieved. When we have a moral compass to guide us we understand limitations. We also understand that the end does not justify the means. So while we work our way to “success,” our morals keep us in check and let us know that even as we struggle to reach those goals, the journey can be success enough. Your methods are your road map. A goal without a plan is like a road to nowhere. First the goal, then the plan, and then the process. While it’s great to have goals, we need also to have a plan in place in order to reach our goals. And any goal worth achieving is worth the time it takes to develop a well-thought out plan to get there. No business should operate with out a one- or five-year plan updated yearly. Even if you’ve never sat down to write out a business plan, the goals in a 12-month plan can really help you focus. You discover where you are, where you want to go, and then you can lay out the strategies that will get you there. By doing this you also make sure you are looking at realistic possibilities rather than pie-in-the-sky dreams. If you can’t find the means either your timing is off, or what you want differs from what you should have. There is nothing wrong with having goals that you cannot achieve right now. Keep them and look for the opportunities that will help you get there. But if you don’t see a way to start working toward those goals immediately, set some shorter term goals that you do have the means to achieve. Many people never achieve their long-term goals simply because they are so far out of reach and they never set the shorter term goals which they can accomplish now. Little do they know that it’s often those short-term goals that set the groundwork to achieve the long-term goals. It’s not enough to have the morals, the method and the means, you also need to be able to manage all of that effectively. Any one of those individually can help move your toward your goals of success, but if you don’t manage everything properly it’ll be a lot more work for a lot less reward. You have to have the management capabilities that guide plans, organize the means and be guided by the morals. Follow these four ‘M’ for success and you’ll find that reaching your goals is far easier than you may have thought. But be careful. If your dreams are too easy to achieve, you’re not dreaming big enough. 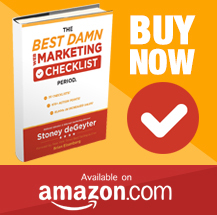 Stoney deGeyter is the author of The Best Damn Web Marketing Checklist, Period!. He is the founder and CEO of Pole Position Marketing, a web presence optimization firm whose pit crew has been velocitizing websites since 1998. In his free time Stoney gets involved in community services and ministries with his “bride enjoy” and his children. Read Stoney’s full bio.